From the 30th January to the 3rd February a meeting was held in Lebanon for recently ordained priests of the Province. On each day talks were given by various speakers touching topics such as child abuse, the sexual life of the consecrated person as seen by a psychotherapist, and also confession. There were also times for sharing in groups. On the second day, various practical points were discussed, such as ordination and the preparation for its celebration. A good part of the third day was spent in sharing in small groups. A lay-person, Sandra Chaoul, came to give a talk about formation in Ignatian leadership. Among other things, she spoke about a formation session on communal discernment and apostolic planning. Next another lay-person, Hyam Abou Shedide, a journalist, spoke about the media and the fact that they touch the three fundamental centres of the human person: intellect, heart and instinct. The afternoon was dedicated to an outing and during the Mass the young priests renewed their vows. The participants appreciated the exchanges among themselves and with the animators. The spirit throughout was pleasant and brotherly. 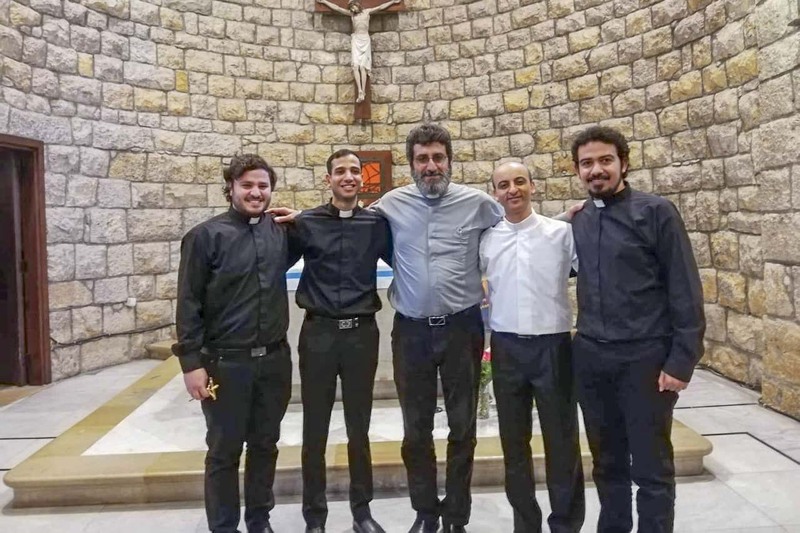 On the 17th November 2018, four novices of the Near East and Maghreb Province, who finished their second year, and are now doing their Juniorate in Beirut, pronounced their first vows. These were Oussama Halim, Houssam Suleyman and Michael Ghobrial from Egypt and Mike Kassis from Syria. Fr. Dany Younes, the Provincial, presided the Mass assisted by Fr. Mourad Abou Seif who is the Master of Novices and Fr. 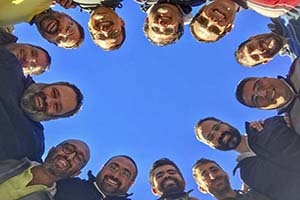 Roney Gemayel, their present Superior, and a number of other Jesuits priests. The Mass was celebrated in the church of Our Lady of Salvation (Sayedet el Najat) at noon. During the homily, Fr. Dany spoke of four main points: a) our vows express our gratitude towards God the Father and Jesus Christ; b) beware of the grace you ask for, because if you ask for love of neighbor, you know the price of love, and if you ask to follow Christ you know where this will lead you, definitely to the Cross; love costs and glory is the ability to strive hard with joy. After the Mass, Fr. Roney Gemayel presented them with a cross. Then those presented we invited to a festive lunch. 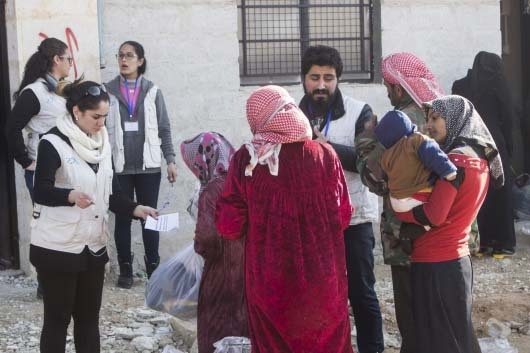 In the meantime, two other Novices, are doing their second year long experiment in Aleppo and Damascus. 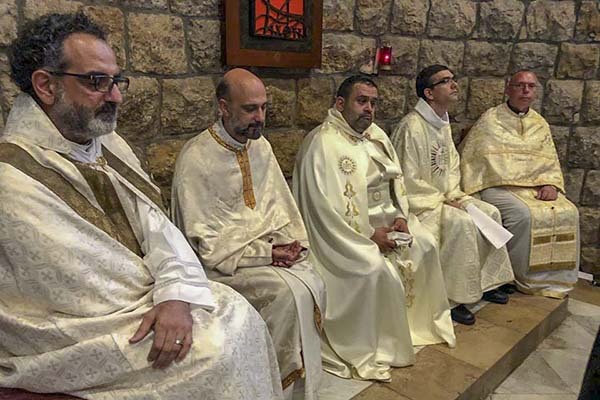 After the ordination of two new priests in Lebanon during the months of June and July, it was Egypt’s turn. 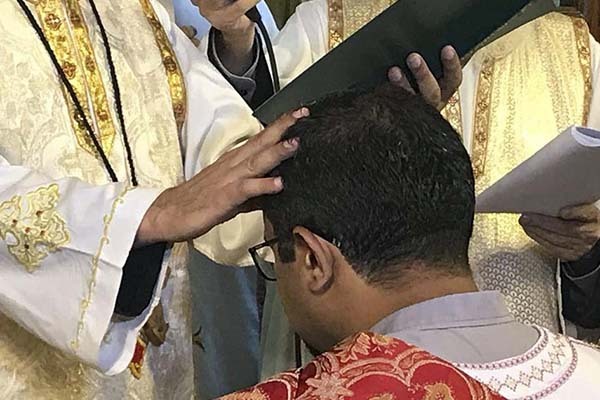 On the 31st of July, in the church of the College of the Holy Family, Mario Boulos was ordained a deacon by His Beatitude the Coptic Catholic Patriarch, Mgr. Ibrahim Ishaq. Then on the 23rd August, it was the turn of Fr. Joseph Nabil to be ordained a priest in the Cathedral of Assyut by Mgr. Kyrillos William, bishop of the diocese of Assyut, assisted by Fr. Provincial, Fr. Dany Younes SJ and a good number of Jesuits and diocesan priests. The cathedral was full of faithful who came expressly to celebrate their gratitude to Fr. Joseph who as a young layman had served for a number of years in the diocese and was greatly appreciated by all. His friends and ex-collaborators helped organise the ceremony and the festive dinner that followed the ordination. Two days later, Fr. Youssef Abdel Nour was ordained a priest in the Cathedral of the city of Minia, again in the south of Egypt, with the imposition of the hands of Mgr. Boutros Fahim, bishop of Minia, again assisted by Fr. Provincial and many Jesuits and diocesan priests. Some Jesuits came from Lebanon and France to assist at the two ordinations. This ordination too was followed by a festive dinner in the cathedral hall. Hungary On 25th of August was the priestly ordination of László Elek SJ in Miskolc. With the end of February, the second year Novices ended their long experiment and returned to the novitiate in Shubra, Egypt. 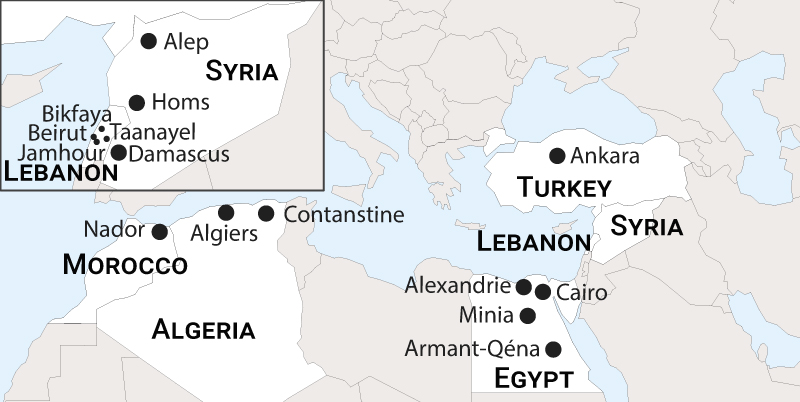 The three Egyptian novice travelled to Jordan (Michael), Lebanon (Usama), and Syria (Hussam), while Mike, the Syrian novice, had his experience at the Petit Collège (primary school) in Cairo. They had various experiences of working with refugees, giving religion classes in our schools and doing various other pastoral works. All four came back enthusiastic about their experience and very grateful for the hospitality and support of the communities they were living with. Meantime the first year novices had the thirty day Spiritual Exercises from the 7th of February to the 7th of March in a retreat house in small village south of Luxor. At the end of the retreat, the whole novitiate community, except Fr. 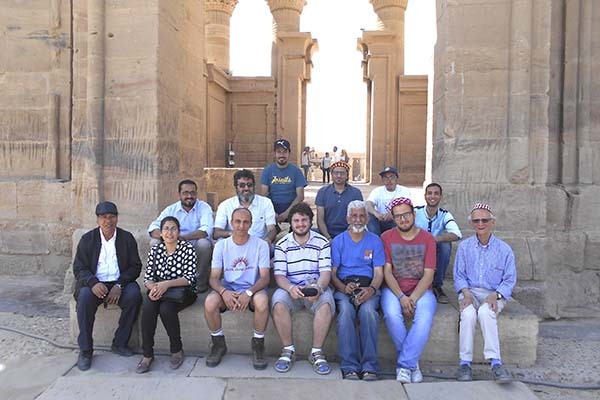 Oliver, who was held back by teaching commitments in the Patriarchal Coptic Seminary and joined later, met in Luxor and from there proceeded to Aswan to spend 5 days together enjoying a well-earned rest and the pleasure of reuniting. Unfortunately, we were missing two members, a first year and a second year novice, who are in Lebanon undergoing some medical treatment. The time in Aswan was a time to visit some of the most beautiful Egyptian monuments from the times of the pharaohs, and the famous Aswan High Dam, as well as to meet people from the Catholic community in the city. We stayed in a small guesthouse run by a Nubian family and built in the typical Nubian architectural style. At the end of the five days, it was time to start the long journey back, with a stopover in Luxor for the night. We left Luxor at 4 pm and arrived in Cairo at 4 am after a quite eventful journey. Now the novitiate formation programme is back in full swing, with the 1st year going deeper into the book of the Spiritual Exercises and their experience of it.